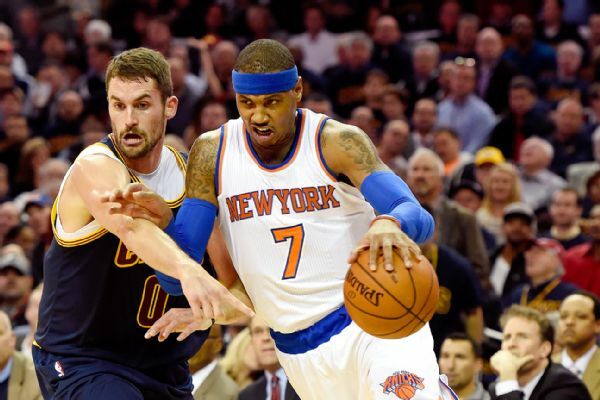 The New York Knicks still want Kevin Love. The Cleveland Cavaliers, apparently, want Carmelo Anthony. Will the two sides make a deal? The New York Knicks continue to pursue Kevin Love in advance of the Feb. 23 trade deadline despite the Cleveland Cavaliers‘ unwillingness to part with the All-Star forward in a deal for Carmelo Anthony, according to league sources. Sources said the Cavaliers, meanwhile, do maintain an interest in Anthony — which would pair him with Cleveland star and close friend LeBron James — but only if a deal can be struck without the league’s reigning champions surrendering Love. Anthony won’t be repping Cleveland if the Cavaliers aren’t willing to give up Love. Which isn’t to say they should be dealing Love; he’s way younger, and he probably plays way more defense at this stage of the game. But the Cavaliers’ salary situation is such that they’ll be hard-pressed to match Anthony’s $24.6 million cap hit, plus a 15 percent trade kicker, without dealing Love. J.R. Smith’s and Iman Shumpert’s salaries would get the deal done, but the Knicks aren’t trading for two players they already shipped away, particularly when one of them (Smith) is on the mend following surgery. Assuming all members of the Core Four are off limits, the Cavs would have to pair Shumpert’s pact with Channing Frye’s and a ton of other fodder, in which case the Knicks don’t really have incentive enough to do anything. That’s infinitely true knowing Kyle Korver’s expiring agreement cannot be swapped, since he’s ineligible be traded in combination with more players. And, again, this is assuming the Knicks even have interest in re-acquiring Shumpert—an ambitious expectation unto itself. To really get the wheels turning, the Cavaliers and Knicks would need to find a third team that sends New York a pick and/or prospect in exchange for whatever Cleveland offers—a la the Los Angeles Clippers rumors. Knowing how many of these hoops there are to jump through, it’s a safe bet Melo sticks with the Knicks, or at least isn’t traded to the Cavaliers or Clippers should he ultimately be moved.